As we approach the shortest days of the year, it is only natural for humans to find ways to increase the light available in their environment. Though no one knows when it was first used, one of those methods was goldwork embroidery, so named because it was most often done with real gold threads. These shiny threads would reflect the light which fell on them, imparting a delightful sparkle to the fabric onto which they were stitched. Such embroidery work was still being done during the Regency, and at least a few of those special goldwork embroidery items were intended as gifts for loved ones during the Christmas season. Goldwork embroidery through the Regency . . .
Embroidery, widely defined, comprises an array of techniques by which a ground fabric is decorated with threads of varying sizes and fiber content worked over its surface. For at least 2,000 years, some of those threads were made of gold, silver or copper. It is widely believed that the first metal threads were made of pure gold, and that embroidery with those gold threads originated somewhere in Asia. By the Middle Ages, goldwork embroidery techniques had reached Europe. Records show that these sophisticated and intricate stitching techniques were in use in England by the tenth century. Initially, goldwork embroidery was used most often for church vestments and garments for royalty and the highest nobility. Such costly materials and intricate embroidery techniques made the products of this type work prohibitively expensive, thereby confining its use to the very wealthy for several centuries. Before the twelfth century, the gold threads used in goldwork were usually made from solid metal. Gold, a very malleable metal, was beaten into very thin sheets, which were then cut into extremely narrow strips. These narrow, thin strips of gold were then couched onto a foundation cloth with fine silk thread. When it became possible to make even thinner strips of gold, those strips were wrapped by hand, spiral fashion, around a core of human or animal hair. However, the use of hair as the core of gold thread was not successful, as the hair often became brittle or remained stiff, making it difficult to work the embroidery stitches. Later, more flexible but study materials, such as animal gut, paper, and parchment were used. These core materials were less brittle, but eventually, the ideal core for gold thread was found to be silk, a fiber which was strong and flexible, and remained so almost indefinitely. The next innovation in the production of gold thread was to make wire of silver, thinly coated with gold. Wire-makers were pleased to discover that silver-gilt wire could be drawn out to great lengths and very fine diameters, without exposing the silver core. By the turn of the eighteenth century, standards had been established such that two ounces of gold would gild about one hundred miles of silver wire. That same standard held later in the century, when the process of wire drawing was mechanized, thereby further reducing the cost. This silver-gilt wire could then be flattened and wrapped around a silk core to produce a strong and flexible gold thread at much less cost than had been required to produce pure gold thread. At about this same time, silver thread was also made, in much the same way, by drawing silver wire very thin, flattening it and wrapping it around a silk core. Eventually, copper thread was also made, using thin copper wire in the same way. It became the usual practice to wrap silver-gilt wire around yellow strands of silk, while silver wire was wrapped around white or grey silk, and copper wire was wrapped around orange or red silk. Despite the very thin metal strips wrapped around a strong silk core, those metal threads were quite delicate and not very smooth. They could not withstand the wear and stress which would be put upon them if they had to be threaded through a needle or pulled through a foundation cloth many times. In addition, even with some technical advancements, these metal threads were still quite costly. Therefore, it made more sense to keep as much of the thread on the surface of the cloth as possible. For that reason, gold, silver and copper threads were usually applied to a ground cloth with embroidery techniques known as couching or laid work. The metal threads were manipulated into place on the surface of the cloth to be embroidered, then it was stitched in place with fine silk threads. Typically, these couching threads were so fine that, with a gentle tug, they would slip between the coils of metal around the thread to the silk core, thereby becoming nearly invisible on the surface. Goldwork embroidery was sometimes worked over bits of felt and/or padding stitches in order to add further dimension to the design. A stiletto, or an implement known today as a mellore, was generally used to aid in easing the metal threads into position and laying them flat on the foundation cloth. One or the other of these tools was also used to conceal the ends of the metal threads on the backside of the ground cloth. The pointed end of the tool was used to carefully push aside the warp and weft of the foundation cloth so that the ends of the metal threads could be pushed through to the back. Once through, they would be anchored in place with a few firm stitches of silk couching floss. The two most common ground, or foundation, cloth types used for goldwork embroidery from the seventeenth century through the early nineteenth century were a sturdy plain weave unbleached linen or a satin weave silk, usually cream in color, to set off the gold threads. However, other foundation cloths could be used for goldwork embroidery, especially when the entire surface would not be covered with embroidery. These other foundation cloths might include silk velvet, silk damask, woollen broadcloth, and later, even cotton broadcloth. Regardless of the ground cloth used, a high thread count, that is, a very densely woven cloth, was preferred, since it could best carry the weight of the metal threads which would be laid down over its surface. Plain weave foundation cloth was generally nearly completely covered with goldwork embroidery, while velvets, damasks and other foundation cloths with a subtle pattern might only have accents of goldwork placed at strategic points over the surface. On some pieces, small amounts of metal thread were used to add special highlights to larger areas of regular thread embroidery. In the first half of the eighteenth century, during the reign of George II, massive quantities of both gold and silver thread were produced in Britain. A large portion of the gold threads were used to embellish military uniforms. However, at that time, embroidery with both gold and silver thread had also become fashionable on a wide array of civilian garments, including coats and waistcoats for gentlemen and gowns and petticoats for ladies. By the Regency, the most common use of goldwork embroidery was still on dress military uniforms. Goldwork embroidery was also employed extensively on some of the official garments worn by the royal family, or their senior courtiers, on ceremonial occasions. Some special church vestments and altar hangings were also embroidered with metal threads during that period, but usually only those used in services at high Anglican or Catholic churches. The garments embellished with goldwork embroidery most often worn by Regency gentlemen were their dress military uniforms, though, in civilian life, some gentlemen might wear a waistcoat embroidered with tracings of gold or silver thread on formal occasions. It was not uncommon for Regency ladies to have a special gown or other garment embellished with a bit of goldwork embroidery. It is known that Queen Charlotte and her daughters were very fond of gowns embellished with floral motifs executed in both gold and silver threads right through the Regency. During the Middle Ages, all goldwork embroidery had been done by professional embroiderers. That was due to the fact that most of the work was done for royalty, the nobility or the Church and must be executed perfectly. In addition, the materials were so costly that they were generally entrusted only to established professionals. By the Regency, many ladies had learned to embroider and, though gold and silver threads were more expensive than wool or silk embroidery floss, they were much more affordable than they had been in centuries past. Though goldwork was one of the most complex embroidery techniques, at least a few amateur embroiderers during the Regency were able to execute such difficult work quite well. For those who wanted goldwork embroidery done but did not have the skill, there were professional embroiderers who could be hired to do the work. Some of the best professional embroiders at that time had been trained in the embroidery school founded by Mrs. Phoebe Wright and supported by Queen Charlotte. Most of the young women who trained at Mrs. Wright’s school had mastered all known embroidery techniques, including goldwork. Goldwork embroidery was very delicate, so it was not possible to wash it in soap and water in the way that the majority of garments were laundered during the Regency. The most commonly recommended method of cleaning goldwork embroidery was to crush stale bread into fine crumbs and mix it with equal parts of "powder blue," that is, laundry bluing powder. This mixture was to be rubbed firmly over the goldwork, then the piece was to be shaken well. Once the bread crumb and blue powder mixture was shaken off, the goldwork was to be carefully polished with a scrap of velvet, preferably crimson in color, to restore its brightness and sheen. Dear Regency Authors, might you allow one or more of your characters to wear, or make, a garment embellished with goldwork embroidery? Will it be a gold-encrusted dress military uniform or an elegant evening gown glittering with goldwork flowers? Or, might one of your characters, perhaps the heroine, be a professional embroideress who specializes in goldwork embroidery? Then again, perhaps the hero, a cavalry officer, has accidentally had something spilled on his dress uniform and the heroine comes to his rescue because she knows how to best clean the goldwork embroidery on his jacket. Are there other ways in which goldwork embroidery can be stitched into a Regency romance? Strange as it may seem, regardless of the time and effort required to create goldwork embroidery, there were those whose favorite hobby was to destroy it. Next week, a survey of parfilage, known more commonly in England as drizzling. 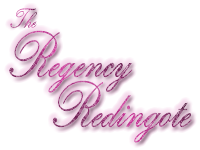 This entry was posted in Apparel & Grooming and tagged Art, Clothing, Regency. Bookmark the permalink. it is notable that the Opus Anglicanum leaps to prominence when more easily couchable cores wrapped with gold came in …. When they have it up, I will share with you the Manx museum’s exhibits of Napoleonic uniforms and conservation techniques. I have a friend on Mann who went to the lectures. I have done goldwork embroidery and hope to take it up again along with whitework and blackwork now that the menopause has put paid to the migraines [the one advantage of getting old] and I loath and despise the hobby of drizzling, which Prince Leopold of Saxe-Coburg took up when Princess Charlotte died. I made it the hobby of an unpleasant sister to Col. Fitzwilliam and his noble brother, when she came to interfere in the lives of Elizabeth and Darcy in my sequel to Pride and Prejudice, Vanities and Vexations. It can stand in a novel as a metonymic for a thoroughly useless person! whereas I suppose the production of something as difficult and fine as goldwork is the sign of a most industrious person. I’ve seen some of the gold embroidered Indian muslin which is beautiful. And probably highly exploitative of the poor Indian women who did it. The plot bunny which came to mind is of a poor vicar whose church has one treasure – an example of opus Anglicanum work as an altar cloth, which is in poor repair. He must take his courage in both hands to ask if the wealthy squire’s daughter, who does goldwork on her own gowns for her own pleasure, will give her time and donate gold threads to repair it. Naturally the spirited and headstrong girl sees this as a challenge, and has to work out that there are only two stitches used, couching for the gold thread, and split stich for the other threads, and she needs to learn the skills to perform the repair, and finds herself falling in love with the vicar at the same time, to the annoyance of her father. Any piece of Opus Anglicanum which survived to the Regency would be very precious. I understand from my research that much of it was destroyed on the orders of Henry VIII when he dissolved the monasteries. But it seems that some very devout Catholics smuggled some of those pieces out of England to Europe in order to save them. Ooooh!!!! Yes, please! I would love to see any information you can share from the Manx Museum’s collection of uniforms from the Napoleonic era. Textiles are my thing and I will certainly enjoy seeing any from my favorite period. Based on your view of drizzling, I think you may enjoy next week’s article. Though I think you will like it even less after you read it. But there are some interesting potential plot bunnies in it. I do write romance as well as mystery…. I buy all my gold threads from Japan, I have to say, which provide high quality for reasonable prices, as well as some which is foil not gold but still of excellent appearance. There’s an excellent London firm which imports Japanese threads, and they do mail order, but I know that a lot of craft stores on the Western seaboard import Japanese stuff so it’s worthwhile seeing what craft stores with mail order there are in California, Portland or Seattle. I did read that very good gold, and silk, threads now come from Japan. But it is nice to have confirmation from someone who has actually used them. Thanks for the tip about the craft suppliers on the west coast. Sadly, most of the needlework and craft shops in my area have closed, so I now have to get most of my supplies from places online. I will check them out. I have gotten lucky on eBay US from time to time, especially when I am looking for vintage needlework and craft supplies. Some of my favorites are no longer made, but from time to time, a former crafter’s stash will show up on eBay with something I need. I will check it out for gold thread. Also, thank you for explaining the Japanese words for gold and gold-colored. That will be very helpful to know. I am not sure if it is cost-effective for you, but have you checked out some of the offerings on Etsy? It was set up for crafters to sell their wares, but there are a number of vendors there who sell some interesting supplies. I am also a crazy quilter, so I search there from time to time for specialty materials. I have looked on etsy, and its sister company folksy, but now I have a good source in London I find that most cost effective especially if I work out a couple of years’ worth of threads at once; I get my machine threads and quilting supplies at the same place.